AVAST Evangelists’ share tips about backing up your PC. This time of the year - summer in the Northern Hemisphere - is the time to enjoy yourself while traveling. You want to protect those precious photos and videos that you take of your children or friends having adventures. In the Southern Hemisphere, it's winter. For students, it's time to do a little computer housekeeping that was avoided during the year. Backing up your PC is not hard, and the tips you get here from the most active Evangelists on the 300,000 member AVAST Forum community will have you backing up your PC with ease. What to backup: Types of documents and data. The first suggestion from our evangelists is that you organize your files into intuitive folders that are easy to find and easy to backup. Establish priorities. If you fail to plan, then you plan to fail. Decide which things you don't want to lose… Documents, spreadsheets, email account details, registration keys, address book, bookmarks, photos, etc. If you identify what's important to backup first, not only is it easier to do the backup task, but you also avoid increasing your internet traffic with big files that do not need to be restored. Separate photos from videos due to their different file size (and future backup method). Separate your documents and data from the operational system and program files. It’s much easier to set a whole folder to be backed up than having to pick and choose files later. Also, think in mobile terms. Online storage allows you to access/restore your files with your phone. Where to store. After you have a good idea of what to backup, two more questions come into account: Local (physical) media or remote (cloud) backup? One is not necessarily better than the other, but consider that physical media, like a USB thumb drive or external hard drive, can be damaged, stolen, or corrupted. Regarding this, HDD disks (portable USB disks) are much better than DVDs. Remote files, on the other hand, can take some time to be recovered. Relax! 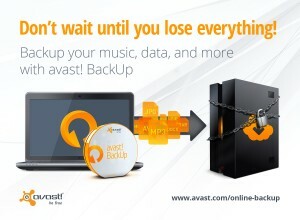 AVAST offers an easy online backup solution: avast! BackUp. With it, you can choose which files, folders or even make sets of files (by extension) and let it do all the work for you! A final note about storage: Don’t forget that Windows could require a system restore DVD to be recovered. Learn how to burn it for Windows 7 and Windows 8. When to backup: Always before it's too late! The keywords are scheduling and set-and-forget. The remote backup is the more convenient choice as you can set it, and it runs in the background when you’re connected. avast! Backup allows you a lot of customization: Bandwidth to be used, speed, etc. Better safe than sorry: You can also set it to do backup at a specific time of the day when you, for instance, are having dinner or taking care of the children. All the remote traffic and files are encrypted for your security and privacy. Backups are to help you, not to be an additional pain, so choose the settings that suit you, that run in the background without slowing down your work. There are also some freeware programs that allow local backup/synchronization. Realtime sync a folder that you need to be immediately backed up. If you don't want to lose some things, back them up. How to backup: The type or method of backup should be divided into disaster recovery (full backup) or data recovery (some specific files). The full backup always takes more time, but you should plan on doing it before installing significant software or upgrading your operational system (to Windows 8.1 Preview, for instance). Once a month will be good. Windows has an internal backup feature for this, although it does not encrypt the data. If you want to be safer, go for incremental backups to save time and disk space. There are incremental backup programs for free in the web. To increase security, you can use a password to encrypt the image files. It’s easier (and generally much safer) to handle small backup files than a whole system image. So, think about when you need a fast data recovery backup and when you need a full one. Your strategy should include having more than one backup. In the worst case scenario, you could save corrupted files that overwrite healthy ones! For the most thorough protection, backup at least one of the copies. Do not put all your eggs in the same basket! Have more tips? Share and comment bellow and thank you for using avast! Antivirus and recommending us to your friends and family. For all the latest news, fun, and contest information, please follow us on Facebook, Twitter, Google+ and Instagram.